Phuket is a large island with a wide choice of beaches to suit every taste and requirement. Most of the beaches are located on the west coast of the Island. The quieter beaches tend to be found towards the island’s northwestern coastline, while the greatest concentration of hotels, shops and restaurants is located around Patong and stretches south towards Karon and Kata. The North-West Beaches of Phuket are generally considered the best beaches on the island. For the most part, they are white sand beaches that slope gently into the sea creating perfect environments for sunbathing and water activities. The majority of beaches located in the north-west are quieter and less developed then the busy south-west coast. However, the area around these beaches are typically pricier. With expensive resorts occupying much of the beachfront real estate, these beaches are less welcoming to the average beach goer that is not a resident at one of the resorts. 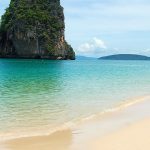 The major beaches are Surin Beach, Kamala Beach, Bang Tao Beach and Mai Khao Beach, but there are a large number of smaller beaches both easily accessible and not easily accessed. The South-West Beaches of Phuket Island are very famous. Not necessarily for their natural beauty so much, as the tourist districts that occupy the surrounding areas.These are the busy beaches that tourists built. 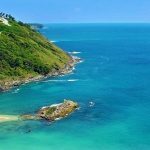 On most of these Phuket beaches, you will find all of the accommodations that you would expect at a tourist beach locale. The beaches are more crowded then anywhere else on the island, but they are also the most accessible to the majority of tourists. Along the south-west coast you will find the infamous Patong Beach as well as the beautiful Kata Beach and Karon Beach. The Beaches in the South of Phuket as a whole are the worst beaches for sunbathing and water-sports, with the exception of Ao Yon Beach. The majority of the beaches to the south are located along the Chalong Bay and Cape Panwa. Most of the beaches along these coasts are rocky and narrow. When the low tide comes in, the water recedes very far from the shore, exposing a muddy and rocky seabed. The majority of the beaches along south Phuket Island are relatively sheltered compared to those along the western coast. During the monsoon season, these beaches do not suffer as badly to foul weather as do the western beaches..